Party Party! 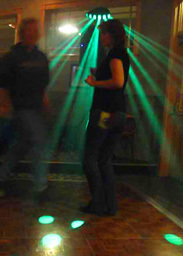 DJ Services has been keepin 'em up dancing, in Nelson, Castlegar, Trail, Rossland and the surrounding areas since 1996. In fact, we often play as far away as Creston, Kaslo, Nakusp and Christina Lake. We're very popular at weddings, but we're always ready for a party of any kind, be it a school dance, corporate function, a birthday or a fund raiser. Playing all of the oldies or the latest top 40, rock and roll or country is our forte and we always play lots of requests. It's all up to you! Party Party! DJ has a compact set up that has a lot of "BOOM", so all we need is a table and a plug-in. Add fog and lights and you've got a nightclub to go. We can accommodate at least three parties in an evening , so we' almost always have a DJ available.